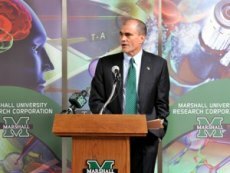 HUNTINGTON, W.Va. – Marshall University today announced it will be partnering with the University of Kentucky (UK) as part of the National Institutes of Health (NIH) institutional Clinical and Translational Science Awards (CTSA) program aimed at speeding the time for laboratory discoveries to benefit patients. NIH has awarded $20 million to support research at UK’s Center for Clinical and Translational Science (CCTS), making it part of a select national biomedical research network. Marshall will be awarded a subcontract of up to $750,000 over the course of the five-year grant. The funding will support scientists in Marshall’s clinical research program, training fellowships and early stage clinical research trials. The partnership also will give Marshall access to the expertise and resources at UK’s CCTS, and opportunities to apply for significant research grants accessible only through the CTSA program. According to Dr. John M. Maher, vice president for research at Marshall, investigators in the national CTSA network are already working together to advance medical research on many of the diseases and conditions that disproportionately affect those who live in the region. He said that researchers at Marshall’s Joan C. Edwards School of Medicine and the Marshall Institute for Interdisciplinary Research will be involved in the project, and that the areas targeted for clinical research collaboration with UK include cancer, cardiovascular disease and diabetes. “CTSA funding of Marshall’s partnership with the University of Kentucky will accelerate our efforts in clinical and translational research, and forge new collaborations to solve some of the most pervasive health problems in Appalachia,” added Maher. Dr. Charles H. McKown Jr., dean of Marshall’s Joan C. Edwards School of Medicine, said the populations served by Marshall’s Robert C. Byrd Center for Rural Health and the UK Centers for Rural Health, which border each other geographically, provide the opportunity to enhance translational research and participation in clinical trials throughout the Appalachian region. NIH launched the CTSA program in 2006 to encourage collaboration across scientific disciplines and spur innovative approaches in tackling research challenges. With the addition of the 2011 recipient institutions announced today, the program is fully implemented and includes 60 CTSAs across the nation. For more information about the CTSA program, visit www.ncrr.nih.gov/ctsa. The CTSA consortium website, which provides information about the consortium, current members and new grantees, can be accessed at www.CTSAweb.org. For more information about the UK CCTS and its partners, visit www.ccts.uky.edu.